I also wrote blog posts for many of the weekly questions which were lots of fun and sparked some good discussions! As this was my first-ever challenge, I think I learned a good lesson - don't be overly ambitious! I missed my goal by a bit here (and by a bit more for kids and teen books). Also, I think I would prefer challenges where you aren't locked into reading certain titles ahead of time - I definitely missed having the flexibility to choose something new to read that wasn't on my challenge list. Of course, that could also be solved with a shorter list, to leave room for in-the-moment choices! All in all, it was a lot of fun....and I finally made a small dent in my TBR shelves! Thanks to Callapidder Days for hosting. I don’t normally read holiday-themed books, but when my online friend Pam said she’d enjoyed Wally Lamb’s Wishin’ and Hopin’: A Christmas Story, it seemed to me like the perfect book to read the week before Christmas. I enjoyed this light-hearted, fun, coming-of-age story very much….and it was perfect reading for a busy holiday week. Lyndon Johnson was president back then, Cassius Clay was the heavyweight champ, and John, Paul, George, and Ringo were newly famous. Our family had a claim to fame, too. Well, two claims actually. No, three. My mother had recently been notified that her recipe, “Shepherd’s Pie Italiano,” had catapulted her into the finals of that year’s Pillsbury Bake-Off in the “main meal” category and she was going to be on television. I was going to be on TV, too – a guest, along with my fellow Junior Midshipmen on a local program, Channel 3’s The Ranger Andy Show. So there were those two things, plus the fact that our third cousin on my father’s side was a celebrity. The setting and the 60’s pop culture references are lots of fun, and Felix tells his story with warmth and humor. I smiled through most of the book, laughed out loud quite a bit, and really came to care about Felix and his family. All of the details of school, family life, and the 60’s bring the novel and the characters to life, in Lamb’s signature style. Certainly, this is a different kind of book than Lamb’s other novels – light-hearted and fun without any serious topics delved into – but it was enjoyable and just right for the season. You don't have to wait until next December to read it, though. Although the book ends with the much-anticipated Christmas pageant, this nostalgic novel would be fun to read any time of the year. We're done traveling (for a few days), so I wanted to share with you all the books we got for Christmas! Books are a favorite gift at our house and for extended family. Here's a summary of the grown-up books we gave and received; to see what kids/teen books we exchanged, check out Great Books for Kids and Teens. My husband, Ken, thrilled me on Christmas morning with several books I've been dying to read. I've already started Great House by Nicole Krauss. I really loved her earlier novel, The History of Love, so I've been looking forward to reading this one. It's a little rambly and confusing so far, but I'm only 14 pages in. He also gave me Caleb's Crossing by Geraldine Brooks. I have loved every one of Brooks' novels and can't wait to read this one! And he gave me Time and Again by Jack Finney because he knows how much I love novels with a time travel plot. I heard about this one when my favorite podcast, Books On the Nightstand, did a recent show on time travel books. I gave Ken the latest Harry Bosch novel, The Drop by Michael Connelly (we both enjoy his novels). I also gave Ken Erik Larson's latest, In the Garden of Beasts. He and I both really enjoyed Larson's Devil in the White City. I will probably read this one when he is done! And I gave Ken a Kindle Fire! He travels quite a bit and doesn't really have his own computer for home (just a work laptop), so he is really having fun with this. He downloaded a 99 cent suspense novel for this trip. I gave my mom, who is an avid reader, The Night Circus by Erin Morgenstern, because I'd heard so many fabulous reviews and figured it was new enough that she hasn't read it yet. I suspect I will be borrowing it from her at some point! Isn't that the best kind of gift?? And we gave her husband, a football fan, 100 Yards of Glory: The Greatest Moments in NFL History, a huge coffee table book filled with pictures and text. How about you? 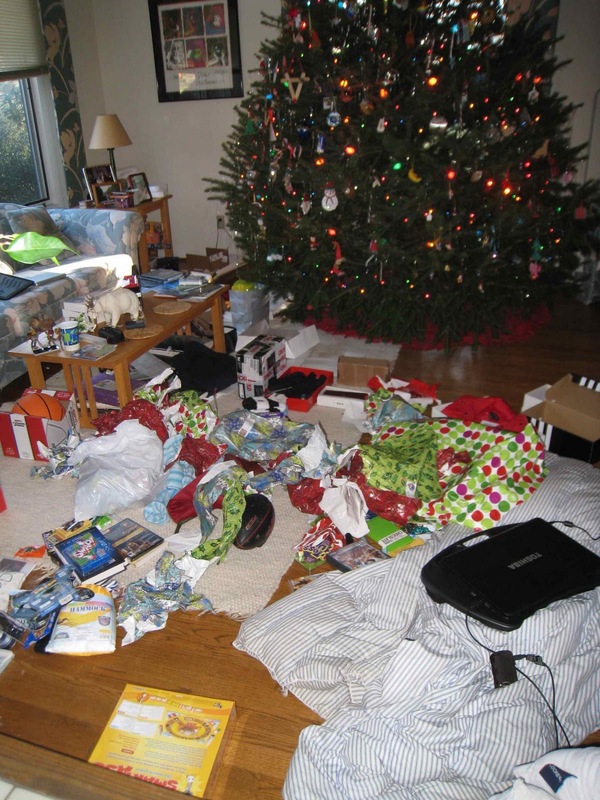 What books and book-related items did YOU get for the holidays? Hope you are enjoying some time off with your family. I hope you all enjoyed some wonderful holiday celebrations with your family this past week! We had a very nice Christmas here. I've included an "after" photo below of what our living room looked like after opening presents! There were lots of great books exchanged, as always - I'll post a list later this week. 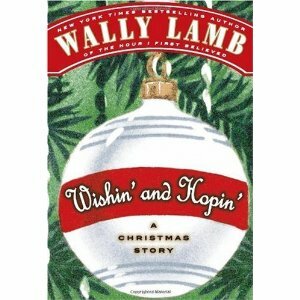 I finished a light-hearted holiday book, Wally Lamb's Wishin' and Hopin', a warm and funny novel narrated by a fifth-grade boy in 1965. I loved it! Perfect reading for this past week. I am now reading Marcelo in the Real World by Francisco X. Stork, a highly acclaimed teen book I had been meaning to read for a long time. It's just as good as everyone said. I finished listening to Breadcrumbs, a wonderful, magical middle-grade novel written by Anne Ursu. My husband, Ken, is reading Gumbo Tales: Finding My Place at the New Orleans Table by Sara Roahen, based on my recommendation. I absolutely loved this book, and he is also enjoying reading about our favorite city and favorite foods. Jamie, 17, is reading the final book in The Icemark Chronicles trilogy by Stuart Hill, Last Battle of the Icemark. You know it's been a busy week when Jamie is still reading the same book he started last week! Jamie finished reading The White Tiger by Aravind Adiga for his World Lit class. He says it's very good and that I should read it. Craig, 13, finished Curse of the Bane, Book Two of The Last Apprentice series by Joseph Delaney, just in time to take his Accelerated Reader quiz before winter break. Craig is now reading Alibi Junior High by Greg Logsted. He wouldn't normally read a book that I recommended (it's a parent/teen thing), but I also recommended this book to his classmates, who've been loving it, so his teacher suggested he try it! I only had time to write one review last week of a memoir, She's Not There: A Life in Two Genders by Jennifer Finney Boylan (who used to be James) - it was fascinating and warm with a great sense of humor. I hope to try to catch up on reviews and other posts during the break this week. What are you and your family reading this week? Enjoy your time off with a good book! I participate in a book group held at a local Unitarian Church. 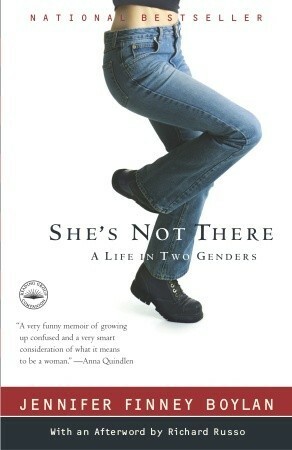 Though we usually choose our own books, in honor of LGBT History Month (October), both book groups at the church decided to read She’s Not There: A Life in Two Genders by Jennifer Finney Boylan, about a James who became Jenny. As expected, the book was fascinating, but I also found it warm and even funny. In the opening chapter, Jenny picks up two young girls who are hitchhiking and realizes that one of them was her student (she’s a college English professor) back when she used to be a man named James. It’s a surreal sort of situation, and she doesn’t know what to say…and the girl never recognizes her. From there, the memoir flashes back to her earliest memory, at age 3, the first time she realized that others saw her as a boy, even though she knew she was a girl. The story continues through James’ young life, as a child, teenager, young adult, and beyond. He knew all along that he was really female inside but struggled to conform to others’ perceptions of him as a male. It’s a fascinating story of an almost unimaginable internal battle. As a child, he came up with the romantic idea that perhaps when he fell in love, that would cure him of these strange feelings of not belonging. And he did eventually fall in love, with Grace who would become his wife, and he really did believe for a while that love was his cure. I think that is the most heart-breaking aspect of this book – the absolute true love that he and Grace feel for each other. They have a happy marriage and two wonderful sons whom they both love. But eventually, Jim can no longer ignore the fact that he always feels wrong, out of place and in the wrong body. He finally breaks the news to Grace (who is shocked) and begins the long, difficult process of fully transforming into a woman, eventually getting gender reassignment surgery. Seeing inside the emotional life of a transgendered person and the people who love her is absolutely fascinating, something that I’d never even considered before. Jim’s journey to become Jenny is both heart-warming and heart-breaking. Making the story even more interesting is the fact that his best friend is fellow author Richard Russo (yes, that Richard Russo) who writes an afterword to the memoir. 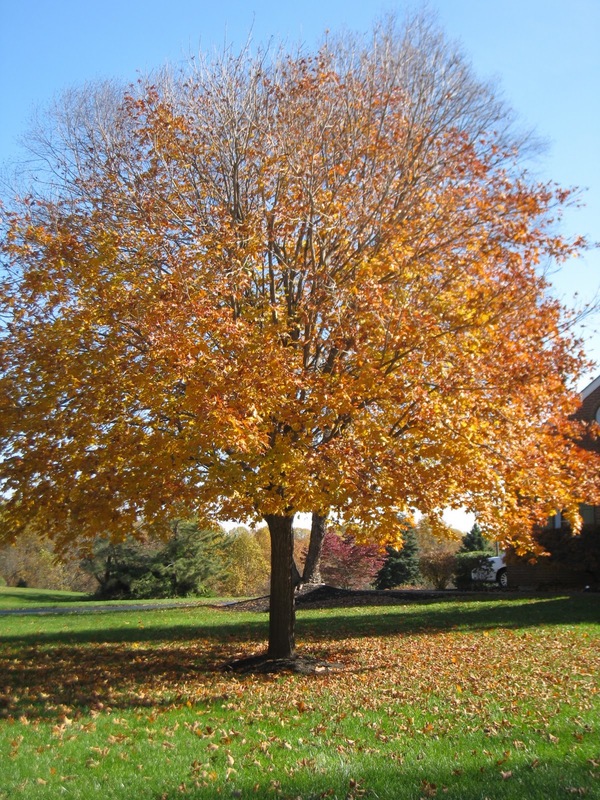 And, yes, she even includes before and after photos that captivated me. Although everyone in our book group thought the book was interesting and it sparked a great discussion, not everyone liked the book equally. I thoroughly enjoyed it, though. I loved Jenny’s writing style – warm, funny, self-deprecating – which helps to put the reader at ease in this unfamiliar territory. The other aspect that makes it stand out is Jenny’s unfailing optimism and positive attitude. In fact, that bothered some readers – that she didn’t struggle even more with this transformation – but she attributes her attitude to her mother’s upbringing and acceptance of her, and there are other transgendered people in the story who don’t have that love and acceptance and are far less well-adjusted, to show how difficult this life can be. Overall, I found this book to be an excellent example of the best kind of memoir – one that tells a fascinating story in a way that makes the reader feel as if she knows the author personally. Fa la la la la! Holiday time and very busy, like everyone else! We spent the weekend in Pennsylvania with my family, celebrating an early Christmas, plus two birthdays. It was great to see everyone and start to enjoy the season (as opposed to just running around like crazy), and I got to spend lots of time with my niece and nephew. I hope you are beginning to enjoy the holiday season, too. I finished Nicholas St. North and the Battle of the Nightmare King, book one of a new series, The Guardians, by children's book veterans William Joyce and Laura Geringer. I enjoyed this seasonal fantasy and reviewed it last week. Next, I read another middle-grade novel, After Ever After by Jordan Sonnenblick, with a very different tone. It's the engrossing, warm story of an eighth grade boy who is struggling with the after-effects of cancer treatment in addition to the usual middle school angst. Now, I am treating myself to a light-hearted holiday book, Wally Lamb's Wishin' and Hopin', a warm and funny novel narrated by a fifth-grade boy in 1965. It's great so far - lots of fun. I'm still listening to Breadcrumbs, a wonderful, magical middle-grade novel written by Anne Ursu, and gave a copy to my niece this weekend for Christmas. My husband, Ken, finished Stephen King's new release, 11/22/63: A Novel, about someone who time travels back to 1963 to try to prevent Kennedy's assassination, and enjoyed it very much. Ken is now reading Gumbo Tales: Finding My Place at the New Orleans Table by Sara Roahen, based on my recommendation. I absolutely loved this book, and he is also enjoying reading about our favorite city and favorite foods. We've also been watching Treme on DVD, so he is immersed in New Orleans culture right now! Jamie, 17, is reading a favorite trilogy, The Icemark Chronicles by Stuart Hill. He finished The Cry of the Icemark and Blade of Fire and is now reading the final book, Last Battle of the Icemark. He says this is one of the best series he has ever read...and that's saying a lot! Jamie is also reading The White Tiger by Aravind Adiga for his World Lit class. He says it's pretty good (high praise for required reading). Craig, 13, is reading The Last Apprentice series by Joseph Delaney - he's currently on Book Two: Curse of the Bane and hopes to finish it this week. I didn't have much time for blogging last week, with all the holiday preparations, but managed to post a review of Nicholas St. North and the Battle of the Nightmare King by William Joyce and Laura Geringer, a unique fantasy novel that tells of the origin of St. Nick. I also posted my response to the last question in the Fall Into Reading Challenge, about what books I would like to receive for Christmas (easy one!). "Here is a list of books I would LOVE to read! Oh, I could go on and on - so many good books! But these are some of the ones I want to read most." And I bought LOTS of books to give as gifts this Christmas, but I can't tell you about those, in case anyone in my family reads my blog. How about you? What books or book-related gifts do you want to receive for the holidays? Monday...a fresh start to a new week. Everyone is healthy and in school, so that's an excellent start!! 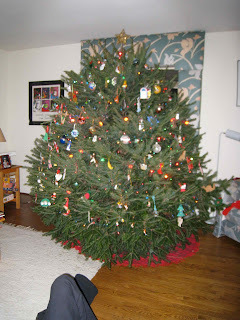 We spent the weekend working on college and scholarship applications, make-up work (my son), and finally getting our Christmas tree and decorating it. The students are LOVING your recommendations!!! Esp. Mike Lupica, Everlost and Alibi Junior High. Parents are thrilled with the fact that their kids are reading more. You really helped start this with your reviews and by talking to them. THANK YOU! As a book lover AND a parent, this just made my day! My son says that everyone is requesting books now, talking about my recommendations, and even recommending books to each other. How exciting! I finished She's Not There: A Life in Two Genders by Jennifer Finney Boylan, a memoir about James becoming Jennifer, for one of my book groups. I loved this book - it was well-written, warm, funny, and fascinating. I am now reading the first book in a new series, The Guardians, by children's book veterans William Joyce and Laura Geringer. Book One is Nicholas St. North and the Battle of the Nightmare King - I wanted to be sure to get to this seasonal novel before Christmas. The series will explain the origins of legendary characters, including St. Nick, through the kind of imaginative fantasy tales you'd expect from Joyce. I'm still listening to Breadcrumbs, a wonderful, magical middle-grade novel written by Anne Ursu. My husband, Ken, is still reading Stephen King's new release, 11/22/63: A Novel, about someone who time travels back to 1963 to try to prevent Kennedy's assassination, and he is loving it. Jamie, 17, was sick all last week with a bad flare-up of his chronic illness, so he did a lot of reading. 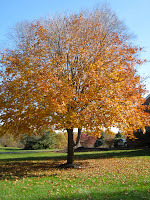 He comforted himself with an old favorite series, The Great Tree of Avalon by T.A. Barron. He read all three books: Avalon, Avalon: The Eternal Flame, and Avalon: Child of the Dark Prophecy. Next, he moved onto another old favorite series starting with The Cry of the Icemark by Stuart Hill. He's been waiting literally years to read the final book in the trilogy because a friend borrowed book 2 from him and never returned it. His friend finally admitted he'd lost it, so Jamie bought the second book last week and is eager to get through the full series. Jamie is also reading The White Tiger by Aravind Adiga for his World Lit class. Craig, 13, is reading The Last Apprentice series by Joseph Delaney - he's currently on Book Two: Curse of the Bane. Not much time for blogging last week (or this week probably) because of all the holiday preparations, but I did post one review of The Songcatcher, a novel set in the Appalachians by Sharyn McCrumb. I recently read The Songcatcher by Sharyn McCrumb for my neighborhood book group. Our discussion this week was interesting because our group was split on its opinion of the book; on a scale of 1 to 10, some of us rated it a 4 and others rated it a 7 (including me). The Songcatcher follows multiple generations of a family, from Scotland to Appalachia, not only through the family members and their descendants but also through a song that originated in Scotland. The story begins in 1751 when 10-year old Malcolm McCourry is kidnapped from his hometown on a small island in Scotland and taken on a ship. On board, Malcolm learns a haunting ballad from a fellow Scotsman that sticks with him during his ocean voyages and later, when he gets to America. The novel alternates between Malcolm’s life and the present day lives of several people in the eastern Tennessee/western North Carolina mountains. The stories follow Malcom and his descendants’ lives until they eventually merge with the modern-day story of an estranged father in Appalachia and his daughter who has become a famous folk singer. The ballad is the thread that ties all of the disparate tales together, as it is passed down through the generations. I really enjoyed this novel, as did several others in our group. I liked the multi-generational approach and found myself wishing I could trace my own family’s roots back that far. I don’t know much about music, but I was also fascinated by the story of the song and the history of the Appalachian culture in general, as well as the historical settings throughout the novel. Those who didn’t enjoy the book as much thought it was somewhat disjointed, bouncing back and forth between the different people and the different time periods. Some found it hard to follow and keep track of everything. I felt that the story pulled me in pretty quickly, so I guess it’s just a matter of taste – that’s what makes a book group so interesting! NOTE: One of our members listened to the book in audio format, which included a recording of the ballad. We all agreed we would have liked to hear that, though the book would probably be harder to follow in audio. Another member has seen the movie adaptation and said it was entirely different than the book! We are now in the midst of the busy holiday season! I haven't even thought much about the holidays yet - other than some online shopping - because it is also college application season. That has been occupying our time and attention - it's like having an extra full-time job! I finished The Songcatcher by Sharyn McCrumb for my neighborhood book group this week. It's the story of an old ballad that is passed down through generations of family, from 1700's Scotland to present day Appalachia, including, of course, the stories of those family members. I enjoyed it very much. I usually read a kid/teen book after an adult one, but I have another book group meeting next week, so I figured I better read that book first. We are reading She's Not There: A Life in Two Genders by Jennifer Finney Boylan, a memoir about James becoming Jennifer, so I'll start that today. My husband, Ken, is reading Stephen King's new release, 11/22/63: A Novel, about someone who time travels back to 1963 to try to prevent Kennedy's assassination. It's a hefty novel, and he keeps laughing out loud at King's spot-on descriptions of ordinary people (one of his many talents!). Jamie, 17, started a new teen dystopian series by Robin Wasserman, The Cold Awakening trilogy, starting with Book One: Frozen, but he gave up with only 30 pages to go! He said it's well-written, but he suspects it's meant more for girls, with very little action in the first book. Jamie said he was more in the mood for fantasy than dystopian books, so he switched to an old favorite, The Great Tree of Avalon by T.A. Barron. Jamie is also starting The White Tiger by Aravind Adiga for his World Lit class. It was hard to find a copy because there's a local book group reading it right now, as well as his entire senior class! Craig, 13, is still enjoying The Last Apprentice series by Joseph Delaney, so he moved onto Book Two: Curse of the Bane this week. Craig has also been reading an excerpt from Flowers for Algernon by Daniel Keyes for his English class - it's one of my favorite books and so sad! Last week, I posted two reviews: Midwives by Chris Bohjalian and Goldstrike by Matt Whyman, a teen thriller. 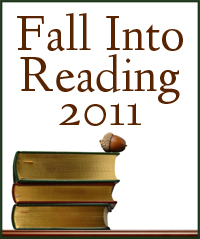 I also posted a summary of my Books Read in November. Wheee!!! December already and moving quickly toward the end of the year. End of the year?? How is that possible? Smokin' Seventeen by Janet Evanovich - a bit of fluffy fun! So, that's 2 grown-up novels, 2 novels for kids/teens, and 1 picture book. I enjoyed them all. I guess my favorite from last month is The Roar, a book my son has been telling me to read for months - he was right, as usual! Where Are You Reading 2011 Challenge Update: I updated my map to include another 2 London locations (The Roar and Goldstrike), Vermont (Midwives), and New Jersey (Smokin' Seventeen), so that brings my 2011 total up to 17 different U.S. states and 8 countries. For my Fall Into Reading Challenge, I have read 5 of my list of 10 grown-up books and 5 out of 10 kids/teen/YA books. With only 3 weeks to go on the challenge, it looks like I may come up a bit short! Thanks to the Fall Into Reading 2011 Challenge, I finally got around to reading a novel my neighbor lent me over a year ago, Midwives by Chris Bohjalian. This one was different from the other Bohjalian novels I’ve read; it’s basically a courtroom drama about a midwife accused of involuntary manslaughter when one of her clients dies in childbirth. Sibyl is a sort of stereotypical midwife, living in rural Vermont with her husband and daughter. She and her husband were hippies in the 60’s and settled down a bit when they had their daughter, though Sibyl still retains some of her innate hippie-ness, wearing peasant skirts and driving a beat-up old station wagon, and, of course, firmly believing in a mother’s right to give birth in her own home. The novel is told mostly from the perspective of her daughter, Connie, looking back at the year her mother was charged and tried when Connie was only fourteen years old. It begins in the courtroom, just before the jury reads their decision and backtracks to gradually fill in the details of what led to the trial. Sibyl was trying to help her client, Charlotte, give birth when a severe ice storm hit northern Vermont, leaving the roads impassable and making it impossible for Sibyl to transport Charlotte to a hospital when things began to go wrong. When she believed she had lost Charlotte, she performed an emergency c-section right there on the bed to save the baby, but the prosecutors claim that Charlotte was not yet dead and that Sibyl killed her with the primitive surgery. It’s a suspenseful courtroom drama, and Bohjalian provides enough background on Sibyl and her family that you come to care for them and hope they survive this disaster intact. The story is especially poignant told from the perspective of Connie, at such a vulnerable age when her life is torn apart by this tragedy and looking back on it from adulthood. I enjoyed the novel and read it fairly quickly. Although I didn’t find it quite as compelling as The Double Bind (still my favorite of Bohjalian’s books), it was suspenseful and thought-provoking.